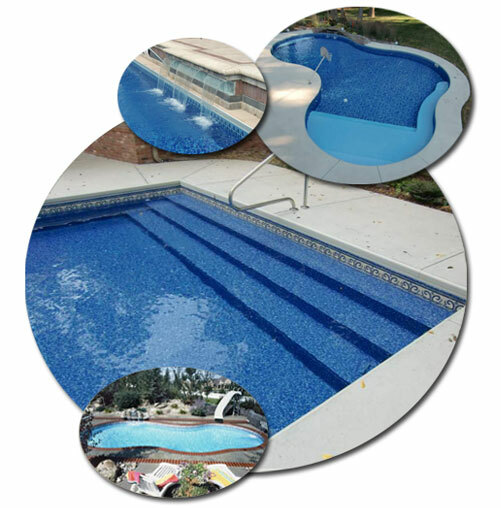 When a customer considers buying a vinyl liner pool from an Indiana inground pool builder, there is often a discussion about the liner and its problems. There is sometimes a perceived unpredictability about the liner as if liner wrinkles happen for no reason. The truth is that we generally know why liners can wrinkle and we know how to prevent the occurrence of wrinkles. With a little knowledge, and proper pool care, you should not have problems. CORRECT SIZING, MANUFACTURING AND INSTALLATION. In order for the liner not to display wrinkles from the get go, the liner has to be correctly sized and manufactured and installed appropriately. Accordingly, it is a HUGE benefit to buy your liner from the same company that is manufacturing your pool kit to help to insure the correct fit, and so that if something is wrong, the liner company is not pointing the finger at the kit manufacturer and vice versa. But as long as the liner is correctly sized, manufactured and installed, your liner should be wrinkle free at the start. If not, your recourse is against your builder and or the manufacturer. So this is not an issue of “unpredictability”, it is an issue of error, builder or manufacturer. Presuming no front end errors, there are still 2 possible sources for wrinkles to occur: drainage issues and chemical damage. DRAINAGE. By drainage issues, I mean the failure to control water around your inground pool so that water does not build up excessively in your pool cavity. If too much water builds up under your pool, your liner can float off the floor and when it comes down it probably won’t be pretty. How do you know if you are being successful in controlling the water in your cavity? During construction, it is good practice to construct a perimeter drain under your pool and tie it into a culvert with a respectable looking lid. That way, you can peak down the culvert with a flashlight after a few big rains to see how things are working. You want the water level in the cavity not to exceed about 2 feet below the surface of the water of the swimming pool. 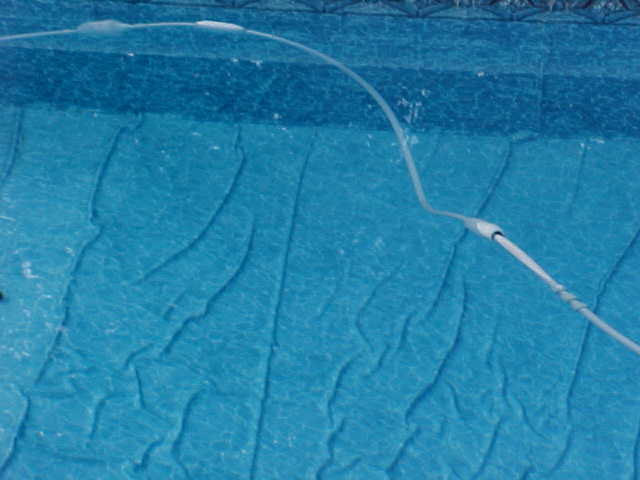 In this manner, the weight of the water in your pool is always keeping your liner tightly in place and it won’t float. If your water in your culvert seems excessive, there are 2 things you can do but I’d advise you do it together with your swimming pool builder. First, double think your drainage plan around the pool. Good drainage is very important to all inground pools to prevent not only liners floating and wrinkling, but other types of inground pools from cracking or rising out of the ground! Most likely, the excess water will be due to run off in big rains that are making it under your concrete and into the cavity. While it would be nice to make sure your drainage was right from the beginning, sometimes issues of drainage are not readily apparent. Check to make sure downspouts and deck drains are appropriately run out and that the grading work around your pool is appropriate so that the water dissipates into your yard. Install appropriate perimeter drains as needed. Second, if nothing else seems to work, install a sump pump in your culvert to keep the water down. Remember that good drainage is always important with whatever kind of inground pool you get. 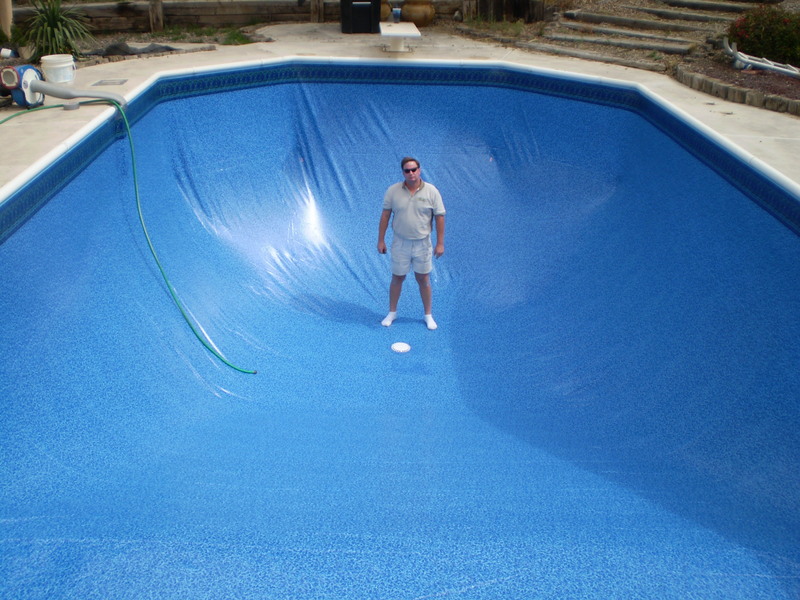 This is not an issue that is specific to vinyl liner inground pools. And actually, the downside of bad drainage with a liner pool is a floated liner which is much better than a pool pop or crack so be grateful for small favors! Also, note that there is a high possibility that wrinkles caused by bad drainage issues can be removed if worked on promptly. CHEMICAL DAMAGE. Finally, we get to chemical damage. Now here’s where the homeowner makes all the difference. Wrinkles develop in liners because of the growth of the liner’s dimensions due to an excess of absorbed water. WATER WILL NOT UNREASONABLY ABSORB INTO THE LINER IF YOUR CHEMICALS ARE KEPT IN THE APPROPRIATE RANGE!! However, high levels of chlorine or low PH will trigger water absorption over time with ugly results that are not covered under any manufacturer’s warranty. Chemical damage is easily identified. PREVENSION OF CHEMICAL DAMAGE. So to prevent wrinkles all a customer has to do is be smart on your chemicals! But why not give ourselves an extra layer of protection. Is there a simple device that allows us to keep our chlorine extra low so we have a bigger buffer before we can reach the stage of over-chlorination? Yes, talk to your pool professional about installing a mineral sanitizer on your pool, such as the Frog by King Technology. These devices pay for themselves by reducing the amount of chlorine you will buy in a season, they allow you to target 1 PPM of chlorine or less (very low) and they have lots of other benefits including your health! And what extra preventative action can you take to keep from getting low PH? Make sure your alkalinity and cyanaric acid levels are correctly set at the beginning of the season. Getting these levels right from the beginning is crucial to maintaining the correct PH for the rest of the season. Of course, regular chemical testing throughout the season is still required but this is made more difficult if you don’t get started in the right way. Hire an inground builder that knows drainage so that you have a plan not to allow excess water to build up under your pool (or elsewhere for that matter); decide up front who is going to do the drainage work, the owner or the pool builder? If you do the foregoing, my guess is that you will get 10-15 years out of your liner as a reward-- and without wrinkles!